We reviewers are supposed to stay objective. However, I went into 21 Jump Street, which I expected to be a derivative soulless pile of cliches, with little hope of enjoying the next 109 minutes. To my surprise it turned out to be the big hulking anatomical joke-spewing genuine bromance-building raunchcom that could. Who knew? Silly to be sure, it never takes itself too seriously, but offers up one of the most diverting high school comedies I’ve seen in a while. The two leads, Jonah Hill and Channing Tatum, are an inspired unexpected comedic duo who are charming, funny and sweet, showing once again total opposites make for the best most interesting and entertaining pairs. Far from a retread of or homage to the TV series, this movie takes only the 80s show’s skeleton as its basis, then creates the body of its story with a new, more ironic comedic skin. The basic story is about sub-par cops going back to high school to bust an illegal drug ring, and potentially become better cops in the process. Beyond that, it’s all about the odd couple’s interaction with each other and the current parade of high school cliques, as they suffer the tortures of living through or reliving through what they both remember as the hardest years of their lives. It’s survival of the hippest, with embarrassments, bad choices, and awkward situations at every turn. If they succeed at the end, which isn’t entirely certain, it will be by working together to move past their own personal histories. It’s a toss up which is more unpleasant… Avoiding being shot to death or navigating the ever drama-filled world that is high school. Jonah Hill has built a career out of his vulnerable sweetness planting us firmly in his rooting corner, and he does it again here. How they mix together the expected and less obvious parts of the two actors’ roles, personalities, and high school experiences, in who becomes popular, who leads the geek clique, who saves the day, and who gets the girl, makes for a much more interesting and less cliched time for us viewers. Look also for Ice Cube in his small role as a hilariously cliched police captain. Jump Street benefits from a mix of good natured winks at the original and a self mockery that lets the audience know it doesn’t find the material too precious to turn on its tatted, pink dyed, or post-punk hair-spiked head. It successfully delivers some very funny scenes while never veering too far from the fun frenetic teen comedy/buddy-cop mold from which it springs. 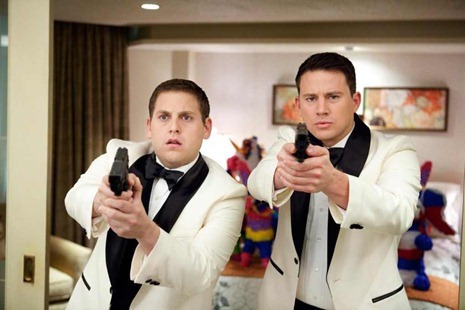 If you were even mildly irresponsible in high school, there will be something for you to relate to in Jump Street. Like other reasonably funny raunchcoms, it’s the kind of film 20-somethings will buy to watch, enjoy and quote from later. As ridiculous as this film is at times, it also has a heart. It keeps us engaged in how or whether the leads travel through their experiences unscathed or changed for the better. Don’t look, however, for MENSA-level scripting or life changing a-ha moments, just some fun and a few big surprises, along with a believable and positive representation of a close male friendship. The film world can always use more of that, as it reaffirms that men that who have lasting, genuine relationships with each other are more apt to thrive and succeed. And who among us got out of high school alive without a little help from our friends?